Failing, Marlene Bauer’s latest exhibition continues to develop an enigmatic visual language of unique experience and inhabited space. The show title references a 1975 musical composition by Tom Johnson, which addresses the layering of languages, and both the confusion and occasional clarity that can result. 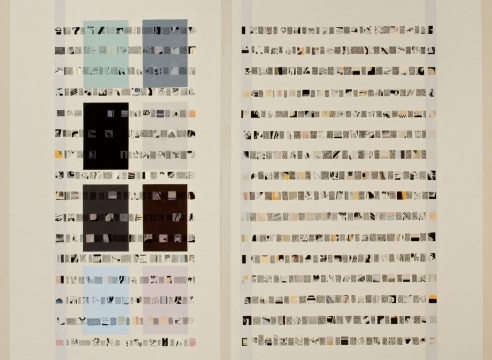 Bauer’s own work has long explored similar issues, especially as they relate to her personal experience of synesthesia, in which she sees language as color or sound. Her paintings explore the complex relationship between individual perception and experience, and artistic creation, striving to create work that allows for an intuitive and unconstrained interaction involving the perceptive senses. She combines subtle, nuanced color fields with abstracted word or letter forms that create visual languages which she can read, and which invites viewers to devise their own interpretations. A Northwest native, Marlene Bauer received her BFA in 1976 from the Pacific Northwest College of Art. Since that time, she has exhibited her work throughout the Northwest while teaching art as an associate professor at Marylhurst University. Her work is in private and public collections along the West coast, including the Portland Art Museum, Oregon Health & Science University, Safeco Corp, and Cities of Seattle and Portland. Public commissions include a columnar mosaic for the Seattle-Tacoma International Airport, WA, and most recently projects for public libraries in Portland and Troutdale, OR.